I’d like to bring up a point that I haven’t seen in the discussion of the demolition of homes in Portland, to be replaced by gigantic houses or apartment buildings that use up pretty much every square inch of buildable space on a lot. In the interests of density, we are told, we have to build structures as large as we can to house as many people as we can. I get that increasing density inside the city can avoid increasing the extent of the urban growth boundary and eliminating farms and green space. But here’s the thing. I spent a lot of the last year and a half studying and writing about Portland in the book–Pieces of Portland: An Inside Look at America’s Weirdest City (see piecesofportland.com)–that was published in June. While doing that, I thought a lot about what makes Portland such a special place to live. One of the best things about Portland are the yards surrounding houses in our neighborhoods. We live in a gardening mecca. Our long growing season and temperate weather make for more gardeners per capita than most any other place. In my Buckman neighborhood, there’s been a big move away from lawns to other kinds of plants, some ornamental, some food-producing, some that are both. Walking along our neighborhoods’ streets, we are treated to a variety of beautiful sights…flowers of all colors and sizes, green leaves that turn crimson and copper and gold, an array of flowers and seeds and fruit that attract birds and bees, beautiful bark in winter, and so forth. And the fragrance when plants and trees bloom! Have you swooned under the spell of the scent of Linden tree blossoms lately? The temperature under a canopy of trees on a hot summer day can be double digits cooler than a street without trees and provide great relief, especially in a summer like the one we have going this year. When the houses are demolished, the yards go as well. Oh maybe there’s a little strip of ground around the edge of the giant new building left, planted with boring contractor plants that all look alike and hold little interest. Or not, as is the case in the multistory apartment buildings that are rising in our midst. And neither do these buildings accommodate the big old street trees, whose canopy extends from the middle of the steet and over the more modestly-sized house that has been affordable to so many Portlanders up until now. When Portland loses perfectly fine old smaller homes, it also loses the greenspace that makes neighborhoods livable. I bet someone smarter than me could calculate the net increase of carbon dioxide when that happens… all these plants consume carbon dioxide and produce oxygen. 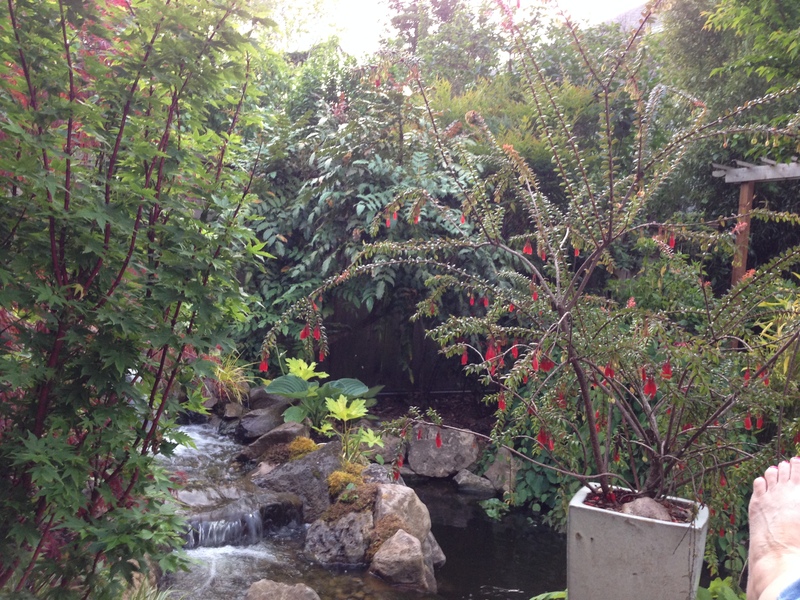 Some plant-filled yards in Portland actually might qualify as carbon credits. A Portland without yards is hard for me to imagine. It would be a completely different city, by any yardstick. They are disappearing a yard at a time, and if we don’t watch out, before long it will be the whole nine yards. And that bothers me as much as the loss of homes because they are so closely connected.